I got this idea from a Bon Appetit tweet, and I guess it’s ironic that I’m writing a recipe because the post was about learning to cook without one. But whatever, my “recipes” are mostly just guidelines and I’m a huge proponent of cooking on the fly. This is the version that I cooked, but there are infinite ways to make this dish your own. The only thing you really need to keep the same, that makes this a really excellent dinner, are the cherry tomatoes. The key is cooking down the tomatoes until they deflate, melting into a sauce that mixes with the olive oil and any other vegetables you choose. For me, it was onion, yellow bell pepper, kalamata olives and capers. I would also recommend adding zucchini, yellow squash, any other types of peppers, mushrooms or anything else you like to eat or find in the produce section of the supermarket. 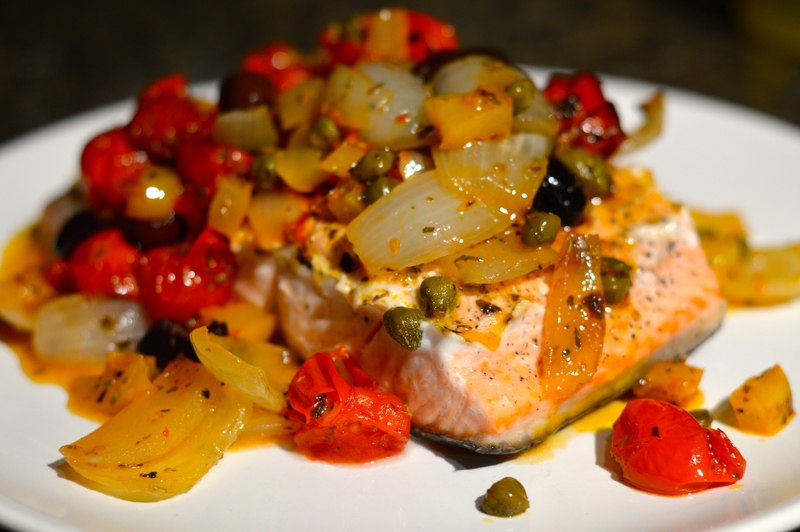 Olives and capers are great in this dish because they add some salinity and texture. I might even sprinkle some sugar over the tomatoes next time; this is an old trick that many people use in pasta sauces to cut down on the acidity of the final product. I wish I’d been able to find a whole fish at Publix like they used in the Bon Appetit photo – that looks so cool. Unfortunately, pickings were slim and I wanted to make sure I used a fish that had skin to protect it from the relatively high heat. I ended up going with boring old salmon. It still tasted great, but wasn’t quite as eye-catching as the professionally photographed version in the tweet. Not that the looks of my meal mattered since I ate it alone on my couch watching old episodes of Entourage (it’s like seeing the movie, but much more free!). Heat oven to 400 degrees. In a medium, oven proof baking dish (I used my 10-inch cast iron skillet), add a tablespoon of olive oil, tomatoes, onions, bell pepper, herbs and a pinch of salt and pepper. Bake for about 20 minutes, or until vegetables have softened and tomatoes have begun to collapse. On the counter, season salmon with salt and pepper. When the vegetables have reached your desired doneness, remove them and turn the oven down to 350 degrees. Place the salmon face down (skin-side up) directly on top of the vegetables and return the pan to the oven. Bake for another 10-15 minutes until salmon is cooked through and flakes easily. You should be able to tell it’s done when the pink center disappears from the center of the thickest part of the filet. Remove the salmon from the pan and flip it over onto your plate. There will likely be enough to feed two people; if so, cut your filet in half. Spoon vegetables and juices over the fish. looks amazing! will definitely remember this as inspiration. I’m a huge proponent of on-the-fly cooking as well–it’s kind of a creative outlet for me. Absolutely. It’s pretty affirming to cook something without any assistance – it makes you feel extra-capable.